For more than 45 years, Whidbey artist Robert Adamson has pursued a love of hand-blown glass. Engaged at Pilchuck Glass School in the early 1970’s as the technical and assistant director, he later turned his vision of glass-making into a highly successful studio and training ground for young glass artists in the Pacific Northwest, when he founded the nationally known art glass company, Glass Eye Studio, in 1978. In the late 90s, Adamson finished construction of his own glass facility, Island Art Glass on Whidbey Island, where he continues to explore sculptural directions in contemporary art glass, including blown, cast and deeply carved forms. Adamson has exhibited his handblown and carved glass all across the United States and is represented in numerous private and public collections, including the renowned Corning Museum in Corning, New York. 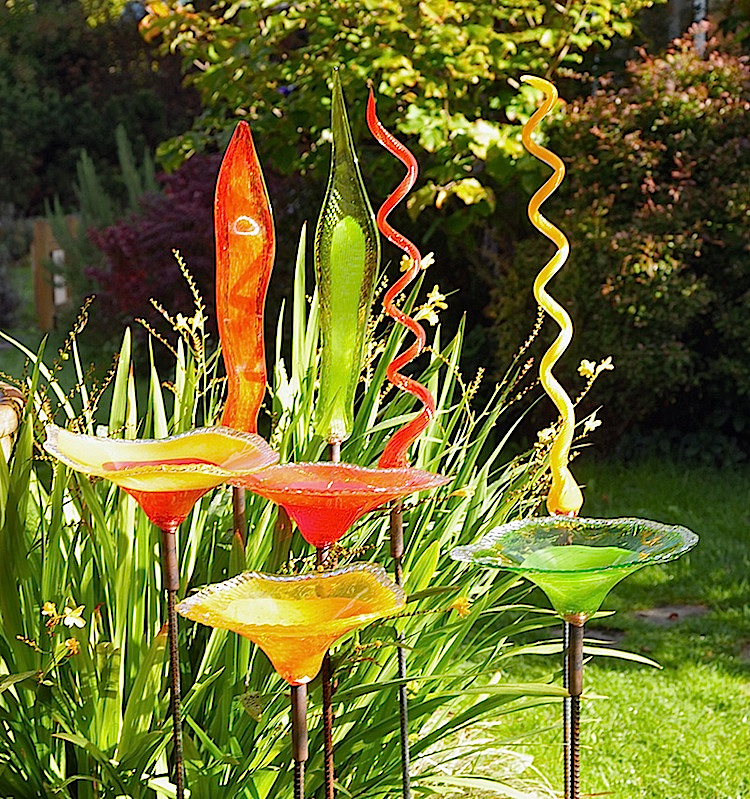 Check out our selection of beautiful handblown glass garden ornaments in a variety of styles and colors on our Garden Glass Page. Whidbey Island glass artist Janis Swalwell has worked with handblown glass design for nearly 30 years. She is also the ace behind the business of producing glass with her husband, artist Rob Adamson, marketing, promoting and selling glass art for their company Island Art Glass, a glassblowing facility on Whidbey Island. Swalwell’s work is modern in style and she’s got a sophisticated designer’s eye when it comes to mixing up color, pattern and shape. Hers is the quintessential contemporary art glass, which she creates by thinking outside the box of ordinary techniques, experimenting with different forms, including pate de verre technique and casting glass.